-Have you fallen down the potholes of life due to health challenges and don’t know how to get yourself back out? -Is your well-being toolbox lacking the tools on how you can help yourself to navigate your way back to a happier road in life and your life’s journey despite your circumstances? -Do you often feel lost or dis-connected from yourself? Do you feel unawake and are you living on auto-pilot in your daily life? -Are you ready to make the changes you so desire to live each day with special intent? -Is it time for you to be more mindful, connected, colourful and creative? Can I now share something with you? I once walked that journey just like you. I have experienced your heartaches. I once walked through the lanes of being stuck not knowing how to pull myself out of the potholes of life because I had no tools to call on when my initial health crisis came about. Initially, I had no idea where to start to find those tools to help myself and my well-being to move forward. Today though, I proudly walk along a new path on my journey. More than anything I want you to tread that new path too. I want to share the tools such as Mindfulness, Chakra, Colour and Relaxation therapies that have helped shaped me into the woman I am today. A woman who feels more connected to herself, and who lives each day being more mindful and empowered. The ultimate guide for your personal self-development and well-being voyage. This eWorkbook has been a real labour of love for me. I’ve taken everything I know about Colouring in, Chakra, Relaxation, Colour Therapies and Mindfulness then shared it with you in one easy package. I want you to see the dynamics of how empowering these modalities can be. Because they are like a seriously epic tonic for your Mind, Body and Spirit. Ask Yourself-ARE YOU READY TO TAKE A SELF-DISCOVERY JOURNEY LIKE NO OTHER? ❤️Are you ready to live your life with passion and ground yourself so that you are mindful in the now? 🧡Are you ready to bring more joy into your life and also be more creative? 💛Are you ready to step into your personal power and so that you can make more mindful choices? 💚Are you ready to have warm loving relationships with yourself and with others? 💙Are you ready to speak your truth and communicate your needs with ease and grace? 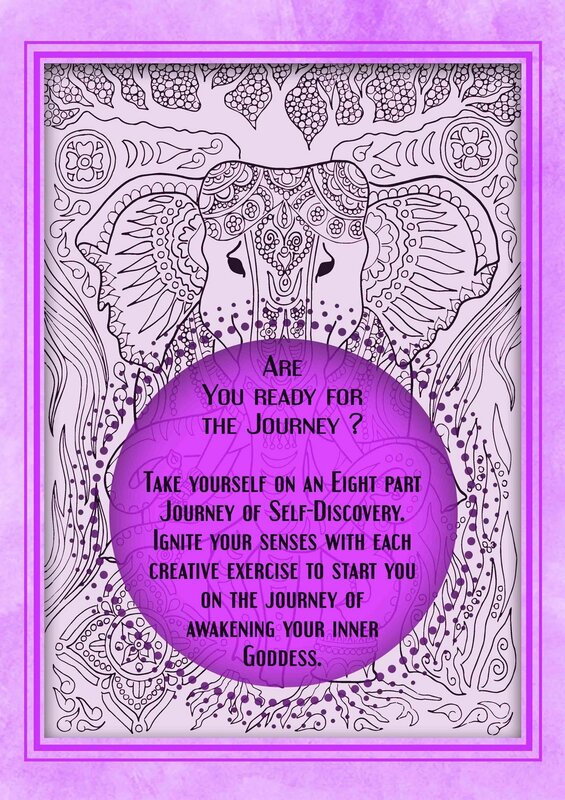 💜Are you ready to embrace your true self & be a conscious being? Journey through the amazing modalities of Colour, Chakra and Relaxation Therapies. CLICK HERE if you are ready now! 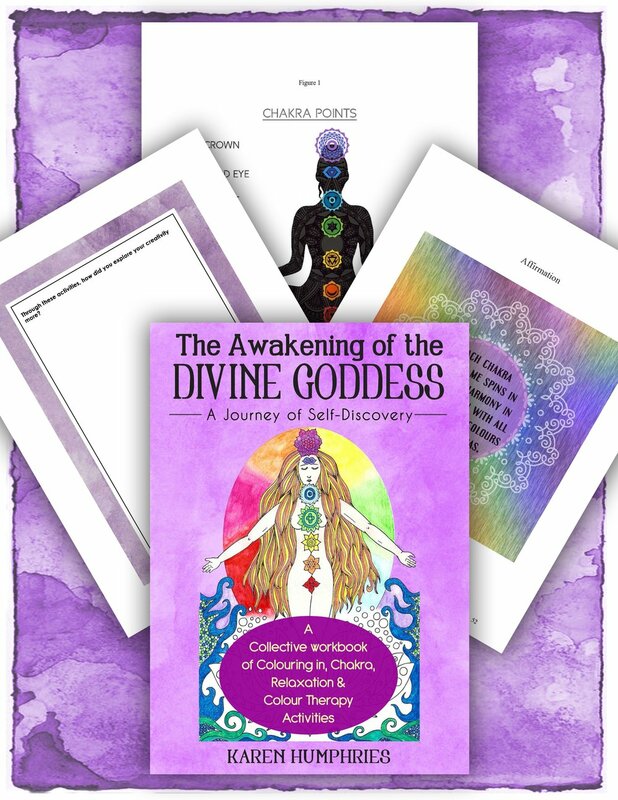 “The Awakening of The Divine Goddess” is a gorgeous resource to help us come back to our heart and find our heroine within – it is pure magic in action! "This workbook was a wonderful way to engage my creativity"
"In the busyness of life, the ability to sit with Karen's workbook and focus on my energy flow is PRICELESS"! "You will find there are several layers to this amazingly creative book, each step bringing you into a deeper knowing of yourself"
The journey of self-development is one that you will be continually on during your life. 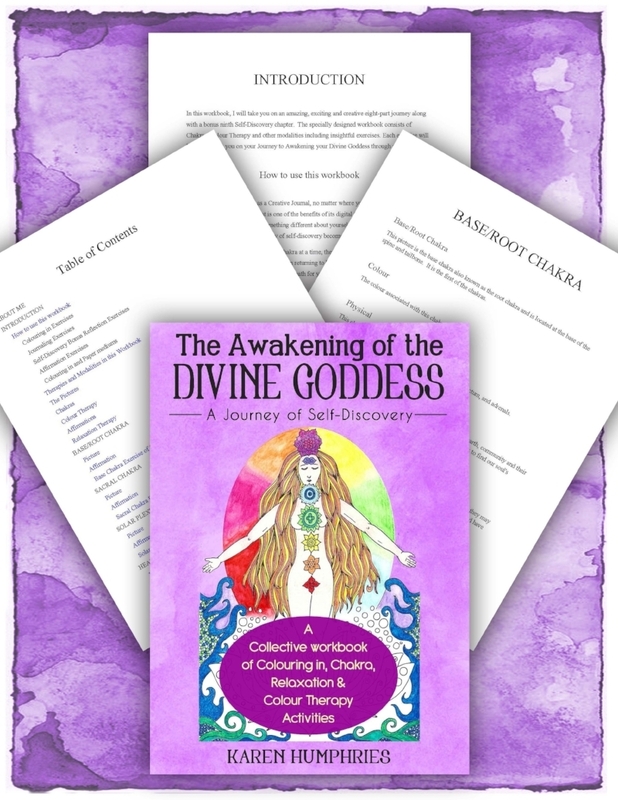 A fantastic benefit of this digital format is that you can re-take this journey to “Awaken the Divine Goddess” at any time in your life. Walk the journey or part of it at any time you want or need to. Now that is what I call empowerment. I am a Women's Well-being Mentor, Author. I use the tried and trusted principles of many mainstream and holistic modalities to do this, plus I have twenty plus years’ experience of both managing and living with a chronic medical condition. I hold a BA in Health, Social Care and Creative writing. I also hold Diplomas in Mindfulness and Colour therapy. Currently I am studying Professional Relaxation therapy and Crystal healing. I have been featured in the Huffington Post and I have been a guest speaker at New South Wales Health, and also been a guest teacher at Coastal Community Connections events. GEt your copy of The Awakening of the divine Goddess now! Dare to awaken and connect with your true self TODAY! This is it. Your chance to get hold of the tools, that will help you to learn how to care for yourself and your well-being and awaken your inner self/Goddess so that you can live your life more mindfully and passionately. And all at a price that only adds up to a few cups of coffee! Investing $19.97 (Australian Dollars) in yourself for a tool that will serve and be at hand for the rest of your life, well that’s something that you can’t walk past. Invest in yourself TODAY! You are worth it! Will I get anything in the mail? No, this is a digital download. You will receive the eWorkbook via a link after your payment has been processed. So please ensure that you save your document as it is only downloadable via this link for 3 downloads only. I have more questions. No worries, I am happy to answer your questions. Just contact me at ﻿ karenhumphries@karenhumphries.com.au and I will get back to you within 72 business hours. I want to use this in my workshops. Please contact me if this is the case at karenhumphries@karenhumphries.com.au to ask about my wholesale rates. How many times can I download it? You have permission to download it 3 times only.